Warning: the following blog post contains spoilers. 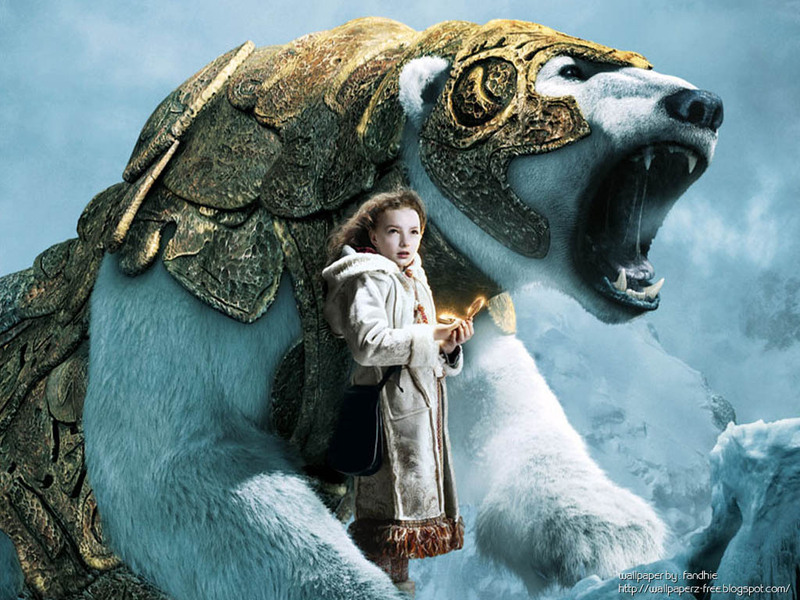 I'm referring to Philip Pullman's His Dark Materials trilogy, a "young adult" fantasy epic that, in my opinion as a sci-fi fantasy geek, compares favorably with J.R.R. Tolkien's Lord of the Rings, Madeline l'Engle's A Wrinkle in Time, and C.S. Lewis's Space Trilogy and Chronicles of Narnia. It's a multiverse-spanning work that tackles heavy matters of theology, philosophy, and quantum physics, while keeping its focus on two tween-aged characters, Lyra and Will, who are at the center of the cosmic battle between the forces of good and evil. While it's written for the YA audience, the attention to detail in both the world-building and the philosophizing is flawless, and there's plenty in here to bend the mind of this double-Masters degree reader. What grabbed me most--and has given this trilogy its notoriety--is Pullman's upending of Christian cosmology. In this multiverse, the being worshiped by the church is called "The Authority," and is an ancient, angelic creature that has ceded its power to a Regent. The Garden of Eden story is taken to be literally true, but also utterly misunderstood: the true hero of the story is the serpent, who helped human beings (and the mulefa, sentient beings in a parallel universe) claim intelligence against the wishes of the Authority. Humans have, in fact, damaged the structure of the multiverse with their scientific explorations, and one in particular, Lyra's father Lord Asriel, is launching a huge rebellion against the Authority. This culminates in a cosmic battle that mostly takes place in the background of the third novel. Will and Lyra witness the death of the Authority--really more of a release, as the ancient being appears to welcome its disintegration--while, in another realm, Lyra's parents sacrifice themselves to defeat the Regent. Will and Lyra fall in love, and their first kiss is the act that begins the healing of all the rifts in space-time that brought about this apocalyptic struggle. Perhaps the west word for the philosophy of these novels is "anti-theology." It does disservice to the subtlety of Pullman's message to see it as a screed against all things religious. In fact, the author calls himself an agnostic, and what I read in this books was careful to put the blame for the excesses of the Church in Lyra's universe down to the misdeeds of ignorant humans who simply don't understand the nature of existence. The church in Will's universe--our own--is far more reasonable in its dealing with ex-nun Mary Malone, a particle physicist who has, through far less magical tools than those used in Lyra's universe, come to understand that her faith in God was misplaced, and that simply living fully in the present is the highest calling of any conscious being. Mary's story, told to Lyra, of how she lost her faith resonated powerfully with me. Pullman's use of Christian symbolism as allegory and metaphor felt to me to be completely consistent with other writers who have worked in this realm, most notably Lewis and l'Engle, although both of those writers were Christian believers. In particular, there's a moment in That Hideous Strength, the culmination of Lewis's "Space trilogy," in which the end of the world is averted by a symbolic coupling in a cosmic marriage bed that instantly sprang to mind as I read the passage about Will and Lyra's first kiss. Of course, this being YA fiction, and being about two twelve-year-olds, it would've been inappropriate and icky to go into any more details about their night together (after the kiss, we flash forward to them waking up the next morning); but then, Lewis, writing in 1945, was similarly restrained in his description of what took place in that marriage bed. What strikes me most here is how Pullman's rejection of the anti-materialism of the church is completely compatible with Lewis's embrace of earthy spirituality. I suspect the two writers could've found much to agree on, had they had a chat over a pint or two of ale in that Oxford watering hole where the Inklings met in the 1940s. More than that, Pullman's principled skepticism resonates well with an archetype present in all of Lewis's novels, a character who, despite being agnostic, assists the main character in finding and embracing faith. Let's step away from this review of novels written fifteen years ago and look at where I'm coming from. I've always believed there was more in heaven and earth than could be dreamt of in any philosophy, whether materialist or theistic, and I've always enjoyed fiction that sought to harmonize science and spirituality. In fact, the science fiction I wrote as a teenager and young adult falls into that category, too. I know that much of what I was writing about, and looking for in the novels I read, was a way to make peace with my inner struggle. The principle that guided me through those years, and ultimately led me to seminary, was that somewhere there had to be a God, because the universe was just too big and wonderful to have come into existence by accident. Pullman's idea--that the being we call God exists, but was not actually the Creator, because no one knows what really brought all things into existence--would've resonated well with me in my youth. Had these books existed then for me to read, I might've avoided the long detour that was seminary and ministry. In fact, though, I did not, and the skills and knowledge I acquired in those fifteen years have shaped me into the careful thinker I am today. While Pullman doesn't make this explicit--and given his own agnosticism, he may not have been able to understand it, anyway--the character of Mary Malone has, I believe, a far deeper grasp of her metaphysical discoveries because of, rather than in spite of, her former life as a nun. Moving through the spiritual world gave me a sensitivity to the deeper dimensions of reality, an appreciation for the ways in which the beauty of the material word is enhanced by a belief that there is far more to it than I can grasp with my limited senses. I see this understanding coming through in the speculative fiction that continues to work best for me, whether it is fantasy, science fiction, or magical realism, and whether it comes from authors who are Protestant, Catholic, Mormon, Jewish, Buddhist, some other religious tradition, or, yes, agnostic. You don't have to be a believer in any particular creed to know that this world is a big, beautiful place, and that embracing it makes you a bigger, more beautiful person. And whether you're a devout Christian or a full-on skeptic, I think there's plenty for you to learn from these challenging, elegant fantasies. Give them a read and call me up; I'd love to have a conversation about them with you.